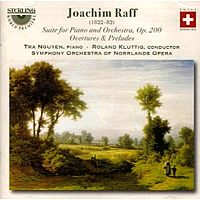 Joachim Raff (1822–1882) was regarded by his contemporaries as one of the foremost symphonists of his age, but in his extensive oeuvre of 329 compositions over half of them are for the piano. 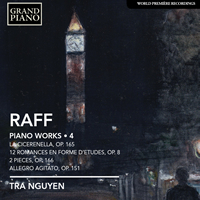 This selection of 21 works offers a cross section of the best of this large catalogue for the instrument, chosen by acclaimed Raff interpreter Tra Nguyen to showcase the varied aspects of his art. Raff’s melodic generosity, his piquant harmonic sensibility and ravishing textures are all on display in these pieces which span the whole of his career, from the exuberant Douze Romances to the majestic Grande Sonate. 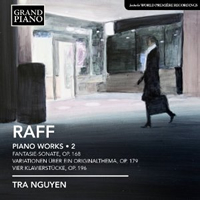 "This is the fifth volume in Tra Nguyen’s traversal of Raff’s solo piano works, and she makes a very strong and passionate champion." 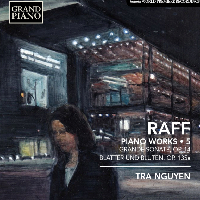 "This fifth volume of piano works by Brahms’s older contemporary Raff finds the excellent Nguyen playing with intelligence and devotion—especially the ambitious Grande Sonate." Nguyen has already shown herself a worthy champion of this oeuvre. 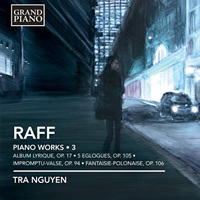 Volume 1, her debut solo recording, made an auspicious start, and by now, more than two years on in a career in which Raff has often been the focal point of her recitals, she understands this music like no other. 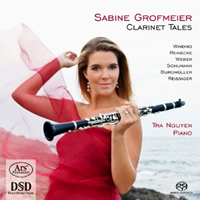 With the substantial technical requirements easily met, she is able to concentrate on creating an expressive Shangri-la for the listener, drawing nurturing warmth, half-forgotten memories, romance and a kaleidoscope of hues and fragrances from Raff’s enchanting scores. 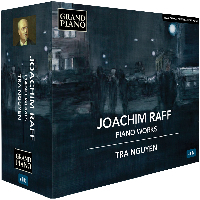 "According to Grand Piano, these are all premiere recordings, and with almost 80 minutes of music, this must be considered a bargain for pianophiles even at full price. 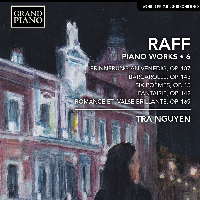 Its value is enhanced all the more by another top-class performance by Nguyen, her technical prowess augmented once again by an intuitive sense of expression and phrasing that brings this magical music to life." "... a labour of love"
"... with a profound sense of artistic mission." "Novel and highly satisfying ... you really shouldn't need any further urging to get this." "This outstanding disk ... the very model of artistic, technical and musical endeavour and generosity." 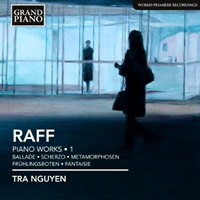 "Any Raff enthusiast could not have wished for a better rendition of the Suite for Piano and Orchestra. Put simply: a must buy." "Productions of this high quality do very well to introduce such well-crafted writing to the catalogue." 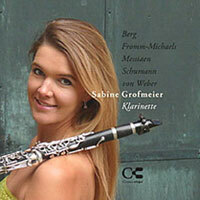 "From the first bar both musicians strike up with no holds barred: Weber's Grand Duo Concertant to warm you up. Perfect! 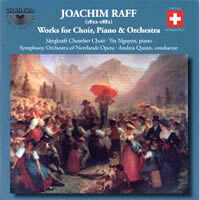 Berg's Aphorismen 0p.5 and finally Schumann's Fantasiestücke Op.73 are ... confirmations of a many-sided talent."